"I attach great importance to the work of European works councils"
On 23rd October 2007 the European Commission decided its work programme for the year 2008. Included is a revision of the EWC Directive (see report in EWC News 3/2007), and explicitly identified as a priority. What policy choices are to be expected by the EU legislator in the coming days and weeks? The editors of EWC News asked Social Affairs Commissioner Vladimír Špidla (photo) in Brussels more precisely. Also the president of the European Commission José Manuel Barroso emphasized his determination for the revision of the EWC Directive on 13th November 2007 in a speech to the European Parliament. The official text for the consultation of social partners is expected to be decided by the European Commission in mid-January 2008. The European Trade Union Confederation (ETUC) has already convened an ad hoc meeting for 17th January 2008 to discuss the new situation. Improving cooperation between national and European works councils, particularly in the event of restructuring, and clear reporting duties of the EWC members in their countries of origin. The European Commission seems determined to put these regulations in force rapidly. It will be interesting to see whether the employers' federations maintain their denial and limit their scope by that. With the adoption of the EWC Directive in 1994 a negotiated settlement failed because of the British employers, while associations from Germany and other countries were open for a pragmatic solution with the trade unions. An EWC Directive negotiated between the social partners could, for example, provide for a joint arbitration board, which is preceded of a court action in case of disputes between EWC and central management. In December 2007 the European Court of Justice (ECJ) in Luxembourg made two fundamental rulings within a few days which affect the right to strike in the European single market. The judges ruled on the cases Viking Line from Finland and Vaxholm from Sweden. On 11th December 2007, the ECJ decided that strike action to defend workers' interests is allowed even if it limits a company's right of freedom of establishment in the European single market. However, the strike may not be disproportionate and must aim at the protection of workers' rights. Ensuring a high social standard is a good of public interest and therefore the freedom of establishment of a single company has to stand back behind it. The cause is a dispute between the Finnish shipping company Viking Line and the sailors union. In 2003, the shipping company had re-flagged a Baltic Sea ferry, that operates between Helsinki and Tallinn, to Estonia and replaced the crew by lower-paid workers. The Finnish union could prevent an escape from the existing collective agreement by the threat of industrial action and internationally coordinated boycott actions. Against that the shipping company requested for an interim injunction -- however not in a Finnish court but at the headquarters of the International Transport Workers' Federation (ITF) in London. The British judges asked the ECJ in Luxembourg for a preliminary ruling on whether the freedom of establishment or the right to strike is to be valued higher in the European single market. This question is now decided. According to the ECJ it is up to the courts of EU member states to judge the proportionality of the strike in each case. In the case of Viking Line, they removed the responsibility from the Finnish jurisdiction and transferred it to the British courts. Whether this is advantageous for the employees' side, it remains to be seen. The European Trade Union Confederation (ETUC) welcomed the ruling, because the right of collective action including the right to strike is given a high priority. However it has to be critized that the judges established strict criteria for cross-border activities. The ETUC will review the court's opinion exactly and examine the consequences for industrial relations. In the Vaxholm case the decision was quite different. On 18th December 2007, the ECJ ruled that the actions of the Swedish construction trade union against the Latvian company Laval were disproportionate. In 2004 Laval errected school buildings in Vaxholm near Stockholm and paid its Latvian employees the Latvian rates. Because the company refused to comply with the Swedish industry-wide collective agreement, the unions organized strikes and boycotts. The dispute was thus triggered by the Swedish Labour Court which switched to the ECJ. In a preliminary decision was to determine whether industrial action is allowed under EU law to force foreign companies to comply with Swedish collective agreements for foreign workers on Swedish soil. This question is now decided, too. Although the judges reaffirmed the right to strike, but declared the actions against Laval as incompatible with the EU Posting Directive. The unions regard the ruling as an attack on existing collective agreements and fear reinforced wage dumping. The European Trade Union Confederation (ETUC) expects legislative changes as a result of this ruling in all EU countries that have implemented the Posting Directive. In March 2007, the European Trade Union Institute in Brussels had presented a study on the right to strike in 30 countries. All EU member states plus Norway, Iceland and Croatia are shown separately. What country-specific features, what constraints should be taken into consideration? Must special conditions be met for a strike? The study answers these questions. After the split of the American electrical company Tyco into three publicly traded companies, the EWC established in 2001 also had to split. In February 2007 it met the last time in old composition. Since 29th June 2007, the three divisions Tyco Healthcare, Tyco Electronics and Tyco Fire & Security and Engineered Products & Services (TFS/TEPS) has been independent. Before the split, three new EWC agreements have been negotiated during eight months. Its content was almost unchanged, there were only a few technical modifications (e.g. the distribution of seats and the taking account of new EU member states). All three EWC agreements are subject to British law and provide for one annual meeting under the chairmanship of the employer. The employees' side elects a steering committee consisting of three members. Tyco takes the same route with the split as American Standard, where the EWC is also separated into three different bodies (see report in EWC News 1/2007). On 13th December 2007, an EWC agreement was signed for Chevrillon Philippe Industrie (CPI) in Paris under French law. The CPI group is one of the largest book printers in Europe with approximately 4,000 employees in France, Germany, the UK, Czechia and the Netherlands and is owned by two financial investors. The employer had sought in the two years of negotiations to implement an EWC agreement below the subsidiary requirements of the EWC Directive, which rejected the employees’ side, however. We have provided further EWC agreements on a special download page. On 15th November 2007 an agreement on the participation in the future European Company (SE) was concluded for the chemical group BASF in Ludwigshafen (on the beginning of the negotiations see report in EWC News 2/2007). Thus the way is free to list the SE in the Company Register in early 2008. On 5th December 2007 the supervisory board, which consists only of twelve members, was already constituted. Half of them are workers' representatives. The existing European works council since 1995 will be replaced by a SE works council composed of 23 members from twelve countries. On 19th November 2007, the Surteco SE has been listed in the Company Register. The group based in Buttenwiesen near Augsburg has 14 production facilities worldwide and supplies the furniture industry and others with paper and plastic parts. Both the structure of corporate governance (executive board and supervisory board) as well as employee participation in the supervisory board remain unchanged. Unlike a German public corporation with more than 2,000 employees, only a third of supervisory board seats will remain for employees, which represents a deterioration of German participation standards. The recycling service Interseroh from Cologne will convert in 2008 into a European Company (SE). The special negotiating body (SNB) meets for the constituent meeting on 8th January 2008 and will then negotiate an agreement on participation and the establishment of a SE works council. Interseroh has a total of 1,380 employees in ten EU countries, Croatia and Russia. In September 2008 the metal wholesaler Klöckner from Duisburg decided to convert into a European Company (SE). Preparations are underway for the formation of the special negotiating body (SNB), which is to negotiate an agreement on participation and establishing an SE works council for 10,000 employees in 15 countries. On 8 June 2007, an agreement to promote diversity was signed for the French food group Danone. In staff selection, attention is to be paid worldwide to different social and ethnic backgrounds, different educational paths and disabilities. On 16 November 2007 the Building and Wood Worker's International (BWI) presented new guidelines for the conclusion of international framework agreements (IFA) and a model text. So far there are already such IFA agreements to protect fundamental labour standards in twelve global companies of the construction and timber industry, including IKEA, Farber-Castell and Hochtief. On 17th December 2007 telecommunications group Telefónica signed a framework agreement in Madrid ensuring worldwide social standards and a dialogue with the trade unions in 19 countries. It is a further development of the code of conduct from 2001. Telefónica employs 220,000 people and is mainly represented in Latin America, besides its home market of Spain. There is a European works council only for the mobile phone division. It includes the offices in the UK, Ireland, Germany, Czechia and Slovakia and was formed in 2004 under British law, even before Telefónica bought the then independent company O2. On 21st to 23rd October 2007, employee representatives from nine countries met in Rimbo near Stockholm to discuss the revision of the EWC Directive and activities in the Baltic states and Poland. The meeting was organized by the Nordic Federation of banking, finance and insurance Unions (NFU). A comprehensive documentation of this meeting is available with us. On 27th November 2007 at its meeting in Rome, the European works council of the U.S. hotel group Starwood (Sheraton, Westin, Le Méridien, St. Regis) signed an agreement with central management on financial aid in case of posting of employees to another EU country. They receive up to one month salary as a relocation assistance and the right to return within three months to their previous job. Starwood had established a European works council according to Belgian law in 2000. About 700 participants from sixteen countries gathered in Rotterdam on 4th December 2007 for the European day of action. After central management's announcement to cut 20,000 jobs, protests were organized jointly by the European works council and the unions (see report in EWC News 3/2007). To date, the EWC has not been properly informed on details of the planned restructuring. On 7th November 2007 it became known that the Dutch printing group Roto Smeets de Boer wants to take over the European branch of the Canadian printing group Quebecor and thus become the largest European provider in the gravure and offset printing. The unions expected a massive staff reduction in the companies involved and accelerated restructuring across the industry. On 23rd November 2007 at a special meeting in Barcelona, the EWC of Quebecor was informed on the new situation. Within two months, negotiations on the extension of the EWC agreement to the new company Roto Smeets Quebecor should begin. A meeting was scheduled in Amsterdam for 18th January 2008 in order to coordinate next steps of the employees' side. But then things turned out differently because the majority of the shareholders of Roto Smeets voted against the merger at the general meeting on 13th December 2007. At a special meeting on 27th November 2007, the EWC of Rio Tinto Alcan was informed of the sale of the packaging and processing divisions. The affected 22,000 employees are to receive a job and wage guarantee - so the demand of the EWC. In another EWC meeting on 10th December 2007, local and Europe-wide protests were planned for mid January 2008. The Anglo-Australian mining group Rio Tinto took over the Canadian aluminium group Alcan recently (see report in EWC News 2/2007) and now wants to clean up the portfolio. A few days earlier, on 20th November 2007, a trade union network for the packaging division (Alcan Packaging) was founded in Istanbul. 19 workers' representatives from six countries were present, demanding the inclusion of the Turkish factory near Istanbul in the EWC. Switzerland is a non-EU country already represented in the EWC. On 7th December 2007, the European Metalworkers' Federation (EMF) expressed concern about the announced acquisition of Aker Yards by the South Korean conglomerate STX. The shipyard group from Oslo employs 20,000 people in Norway, Finland, Germany (Wismar and Rostock), France, Romania and other countries. There is no European works council so far, which could be consulted in the merger case. While many European works councils are still limited to information and consultation rights, some initiatives already go beyond the narrow legal framework. One such example is Freudenberg, a German company with 33,000 employees, manufacturing rubber and plastic products for industrial clients and consumers. In autumn 2007 the EWC initiated a European project on occupational health and safety: Hazard analysis using a safety and health mapping. More than 30 employee representatives from Germany, the UK, Denmark, Sweden, Spain, France, Italy, Hungary, Austria and the Netherlands were trained to mapping coaches for their respective countries at a plenary meeting of the European works council on 5th to 7th November 2007 in Weinheim (Germany). In the second half of November 2007, a first mapping took place in Langres (France). In January 2008 events in the UK and Italy, in February 2008 in France will follow. Later mappings in the Netherlands and Austria are added. The EWC is planning an evaluation in late 2008. The project will contribute not only to a transfer of "good practice" in occupational health and safety, but also strengthen the cooperation within the European works council significantly. In an interview the EWC chairman Bernd Schneider (photo) explains how the idea came about and what other European works councils can learn from it. The implementation of the mapping is done by employee representatives. Mapping coaches should be qualified by external consultants. The mapping is to meet uniform standards across Europe. The steel group ArcelorMittal goes beyond Europe. At the world conference of employee representatives of 16th to 18th September 2007 in Montreal (Canada) it has been agreed with central management to ensure a higher standard of health and safety in all 61 locations in 27 countries worldwide. For this purpose, a working group ("Task Force") composed of union representatives and safety experts from the company is formed to target individual locations in all continents in order to eliminate deficiencies. Measures of workplace health promotion are also supported by the European Commission, including the project "Move Europe". Interesting is the toolbox of the European Network for Workplace Health Promotion with tools from 23 European countries in the areas of work and health. Why are German works councils so reluctant in the EWC establishment? At the Department of Sociology at the Technical University of Munich is currently under investigation as to why German companies have a higher than average delay in the establishment of European works councils. Sponsored by the Hans Böckler foundation the research project is looking into the reasons causing the German works councils and employers to refrain from the establishment of a cross-border employee representation. In percentage terms, Germany occupies in the ranking of the major industrial countries of the EU the rear in the creation of European works councils. The researchers led by Prof. Dr. Rainer Trinczek first checked the database of all recorded German companies covered by the EWC Directive and were able to update the database maintained for many years by the European Trade Union Institute in Brussels. They found for 2007 a total of 461 German companies in the scope of the EWC Directive, of which only 28% have established a European works council. For comparison: in Sweden there are already 48%, and in the UK, France, the Netherlands and Austria, about 40%. This means that Germany is twice at the top of the EU: no other country has such a large absolute number of existing European works councils, and no other country has so many not yet established European works councils. The majority of European works councils already exist in the metal sector (58 German companies), there is also the greatest backlog (143 German companies). In second place follows wholesale and retail, where 49 German companies still have the EWC establishment ahead. The largest percentage residue is at "other services" and in the transport sector. The study shows across all industries: the larger the company, the higher the probability that there is an EWC. Only in the service sector there are companies with more than 10,000 employees without European works council. On this informative website in eleven languages, explanations of the main acts of the European Union can be found. The texts are suitable for short and quick introduction to all areas of EU legislation. In a special chapter on social dialogue and employee representation there are acts on parentel leave, part-time work or temporary contracts as well as the most important Directives on participation. With 160 employees, the training institution FNV Formaat based in Woerden near Utrecht offers a comprehensive program of seminars and consulting services for Dutch works councils. Also European works councils based in the Netherlands are supported by FNV Formaat, including with an EWC newsletter published several times per year in Dutch and English. FNV Formaat works with the Dutch trade union confederation FNV and is comparable with the DGB-Bildungswerk in Germany. In early 2007, a EU-funded project started to build up trade union networks in northern Europe with focus on the Baltics. Transport unions from eight countries want to support international truck drivers. A website provides information in English. The Netwerk Vlaanderen reveals on its website which of the big banks operating in Belgium violate environmental and social standards by their investment practices in other parts of the world. The focus is on business policy of Citibank, ABN Amro, Fortis, ING, Dexia, KBC, Axa, Deutsche Bank. A study of 11th December 2007 lists human rights violations. The Netwerk Vlaanderen promotes environmentally and socially responsible approach to money. We have compiled many other interesting links in a link collection. In October 2007, the Brussels-based Social Development Agency (SDA) presented a study on equal treatment of men and women. The authors go into the question of how to increase the presence of women in the bodies of employee representation and the role of European works councils in action on equal treatment for the workforce in Europe. To this end they present text examples in EWC and in anti-discrimination agreements, that have been concluded with the assistance of European works councils, such as in the energy company Areva. On 7th December 2007 the European Trade Union Confederation (ETUC) in Brussels presented a booklet describing its strategy and action plan for the years 2007 to 2011. 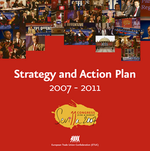 The action plan was adopted in May 2007 at the congress in Seville. The priorities are described on 156 pages: from social dialogue to employment and economic policy to strengthening the social dimension of the European single market. A separate chapter deals with the work of European works councils. The booklet is available in German, English and French. In October 2006 the most comprehensive reform of the corporate law in the United Kingdom for 150 years came into effect. The new Companies Act requires managements in principle to consider the impact on employees, community and environment when making decisions and to be publicly accountable about it. Aim of the guide is to increase the success of British companies in social and environmental issues. The authors point to a number of ways to help the new law becoming a success through the use of shareholder rights, political campaigns and legal action. Works council members from various economic sectors met from 4th to 9th November 2007 to exchange views on the negotiation of EWC agreements and the strategic development of their European works council. Run by the Institute for the further education of works councils (ifb) and co-shaped by the training and consultancy network "euro-workscouncil.net" a dialogue across industries could be conducted in Hamburg. Works councils from companies in the pharmaceutical and electronics industries, food processing, water treatment, market research, wholesaling, the petroleum industry as well as software providers, banks and automotive suppliers were present. To meet the growing demand for such cross-industry EWC events, a completely new and expanded seminar series has been designed for the year 2008 (see report in EWC News 3/2007). Negotiations on the establishment of a European works council in the Frauenthal group will begin in January 2008. The group is run from Vienna and consists of eleven production facilities with approximately 3,000 employees in Austria, Germany, France, Portugal, Romania, Slovenia and Poland. The focus is in the manufacturing of components for commercial vehicles (springs, handlebars, catalysts) and in the plumbing and heating technology. With the help of the training and consultancy network "euro-workscouncil.net" first key issues were discussed from 14th to 16th November 2007 in Kassel for the upcoming negotiations. An important point is the adequate representation of all businesses in the future EWC. From 19th to 24th November 2007 the final conference of the LINKS project was held in the northern Italian port city of Livorno with technical support of the training and consultancy network "euro-workscouncil.net". About 50 participants from seven countries discussed the establishment of European works councils in an industry that has significant growth rates and is undoubtedly one of the winners of globalization. A similar workshop was held in May 2007 in Constanţa on the Black Sea (see report in EWC News 2/2007). So far, there is only a single EWC in the whole container handling for the company Dubai Ports World (see report in EWC News 3/2007). On 5th December 2007 the legal situation of British EWCs was discussed at the headquarters of the British TUC in London (photo). After a dispute in the ferry company P & O in 2002, whose backgrounds are currently being analyzed by the training and consultancy network "euro-workscouncil.net", there were no more court proceedings of a European works council on British soil. The unresolved question of the legal status of EWCs and significant financial risks have deterred the British trade unions since, said the EWC coordinator of the TUC, Sean Bamford (see interview in EWC News 3/2005). The completion of the report is planned for early 2008. As part of an EU-funded project, managed by the research institute Cesos in Rome, the training and consultancy network "euro-workscouncil.net" is currently conducting three case studies on the practical influence of German works councils on restructuring (see report in EWC News 2/2007). To this end, the group ContiTech was also selected, a high-tech division of Continental's seven business units in the rubber and plastics technology. Earlier, the packaging group Smurfit Kappa and the forklift truck manufacturer Kion already were the focus of attention. All documents will be available shortly on the website of the project. The training and consultancy network "euro-workscouncil.net" produced a guide that explains the most important aspects in the establishment of European works councils: legal issues, steps to establish an EWC, the negotiation of an EWC agreement, content of information and consultation rights, practical work in the EWC and its financial conditions. The study was supported financially by the European Commission and highlights in particular the situation in the courier, parcel and express service sector using the company examples DHL (Deutsche Post), FedEx, Securicor, TNT, UPS and Wincanton. It is available in English, French and German on request. The German magazine Personalführung (personnel management) published two articles by Werner Altmeyer: in October 2007 on current developments in EWC consulting and in December 2007, a book review on participation in the European Company (SE). The acquisition of the Hilton hotel group by equity firm Blackstone illuminated an article in the October/November 2007 edition of the German magazine Mitbestimmung (codetermination). Other publications can be found on our publications page. On 21st December 2007, the latest edition of the German-Austrian EWC newsletter of ver.di and GPA appeared. It deals with the revision of the EWC Directive, several initiatives for the establishment of European works councils, the work of the ver.di department for utilities and waste management companies, European connections of GPA as well as protest calls against restructuring in Volksfürsorge and Novartis. Furthermore, a national report on the UK, seminar dates, meeting reviews and literature tips are included. The newsletter is produced by the training and consultancy network "euro-workscouncil.net" and published only in German.